Depending on where about downtown Vancouver you’re located each of these 10 options would be great for you. If you’re looking for monthly parking, these downtown Vancouver parkade offers monthly parking offers as well competitively. Namely the top 3 also offer the cheapest for monthly parking in downtown Vancouver. Here’s the list of the cheapest parking in downtown Vancouver. (maybe not the cheapest but cheap parking anyways). Pictures are taken from Google using Google maps street view. Sorry, as much as we like you guys, I’m not about to hop to 10 different locations downtown just to snap a picture when we can take it on Google equally as good. Go Google! A little out of the way but a lot to save. 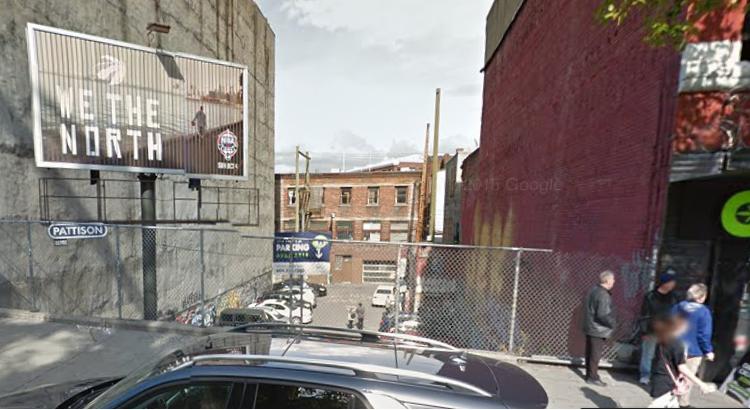 Parking is only $70/month at 1237 Davie Street. An ideal long term parking for deal seekers. This parking spot is very near to Sushi Bar Maumi in Davie Village on our list of the best sushi in Vancouver so you can enjoy sushi after a day of work. Another perk to choosing this as your long term parking location is it’s right beside a grocery store so you can pick up grocery on your way home. How convenient! For hourly parking consider 843 Seymour Street for cheaper and better location to Vancouver’s downtown core. Still this is cheap downtown Vancouver parking with many perks to convenience which is why this is listed first for cheap parking in Vancouver. Get a deal! 1237 Davie Street marking entrance. Picture from Google. This location is ideal for monthly parking solutions. 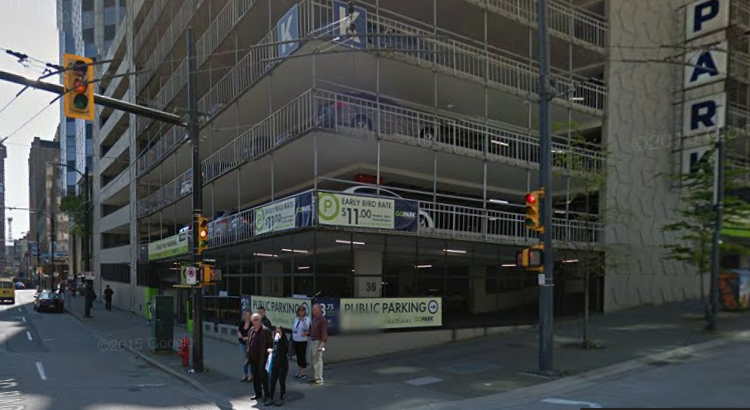 This is likely the cheapest downtown Vancouver parking you can find for the location. The price is only so because of an ongoing promotion. 930 Seymour Street is fairly convenient location closer to downtown than the West End Vancouver. It’s near Staples for your office supplies should you be running low on printer ink (maybe from printing this list of the cheap parking in downtown Vancouver). 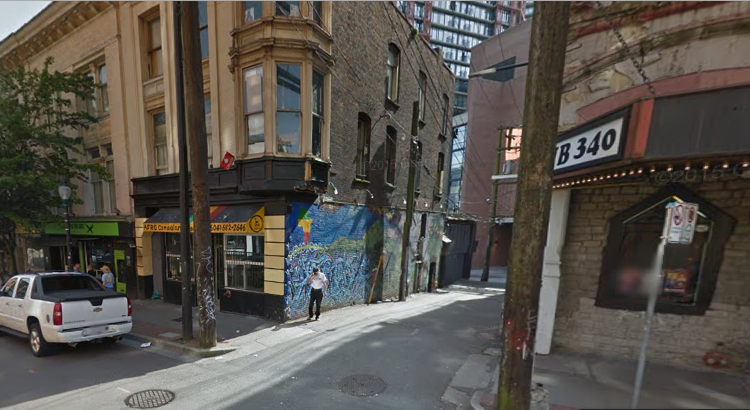 It’s also near a some good cafes (but where are you now in downtown Vancouver? Here’s the best Cafes in Vancouver.) Parking is cheap though at least. Cheap parking in downtown Vancouver at 930 Seymour Street. Picture used from Google. Located right in the center of the Downtown core, this is one of the cheapest parking in downtown Vancouver for the location. It’s an excellent monthly parking location if you’re looking to get near your centrally located office at the TD building. The pricing is more than most other parking locations because it’s right in the heart of downtown. This parking location is very central in downtown Vancouver. You’re a block from Granville street if you plan on parking on Fridays after work. It’s right next to UBC Robson where you’ll frequently find food trucks out which makes a good bite on your way back from the office to your car. There’s coffee and pizza nearby too. This is a great parking location but slightly at a premium. If you value your convenience and walk time then it’d be a good trade-off but maybe you prefer your morning walk in downtown Vancouver with coffee and croissant (talking about croissant, here’s the list of the best bakery in Vancouver) in hand while you hear the bird chirp and the construction growl? Cheap parking in downtown Vancouver near UBC at 900 Howe Street. Picture from Google. An excellent solution for hourly downtown parking. You’ll be paying $2.50 an hour for parking in the heart of downtown. Certainly one of the cheapest hourly parking in downtown Vancouver. This is absolutely the best cheap parking in downtown Vancouver for those needing cheap hourly parking in downtown Vancouver. 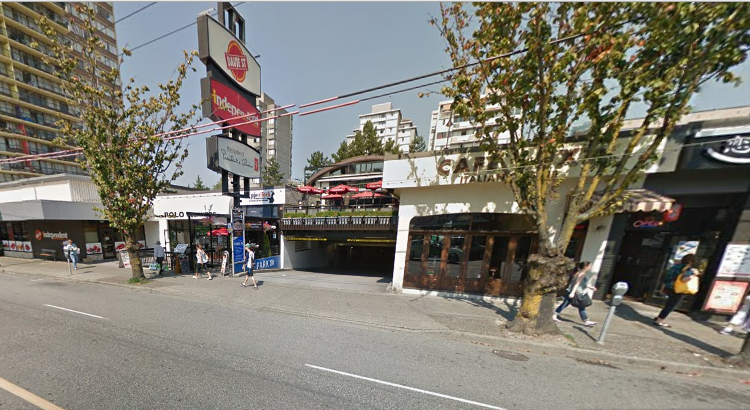 The parking spot is located about 2 blocks from Robson Street where the restaurants are. It’s also near Dunn’s Famous which happens to be on our list of the best poutine in Vancouver for none other than their smoke meat poutine. (Dunn’s Famous is famous for Montreal style smoke meat). Consider this hourly parking spot for catching a bite at Dunn’s. Conveniently near to Orpheum theatre and Nester’s for grocery run. Cheap hourly parking in downtown Vancouver at 834 Seymour Street. Picture from Google Maps, street view. 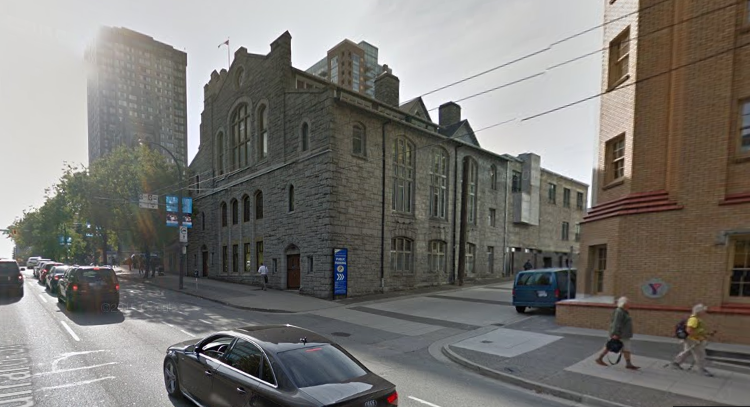 Also known as First Baptist Church, this parking location is centrally located near UBC Robson and Sheraton. You can take a skytrain to downtown Vancouver, Waterfront station or walk there in a few minutes. The location is also about 10 minutes walk to English Bay and accessible to Yaletown by the Canada Line skytrain from City Hall station. This is our preferred parking location for the pricing and locality. This cheap downtown Vancouver parking spot is just a little out of the way but very conveniently besides the Robert Lee YMCA for gym goers. Perhaps stop by before or after work for a brief workout or fitness class; apparently, working out in the morning provides more energy and mental agility throughout the day. If fitness is not your bid, you’re a block south from a grocery store and a block east will find you Tim Horton’s. Entrance is just before First Baptist Church as pictured. Cheap parking in downtown Vancouver at 969 Burrard Street (First Baptist Church). Picture from Google maps, street view. This parking location is a bit towards the East of downtown by Gastown but still centrally located and a good parking spot for $2/hour. It’s an outdoor parking spot on the cusp of Gastown which makes it a cheap hourly parking spot in downtown Vancouver if you planned on dining in Gastown. Maybe park here as you dine at Al Porto Ristorante on our list of the best Italian restaurants in Vancouver. Other nearby attractions includes the Revolver Cafe and the infamous “Meat and Bread”. Effectively, it’s a good parking option if you’re looking for cheap parking as a visitor to Vancouver for a couple hours downtown. Not the best part of town however. It’s a little hard getting to this parking spot. You cannot turn into it from W Hastings street actually as it’s a different elevation. To enter this cheap parking spot in downtown Vancouver, you have to drive through the back street of W Hastings where the back entrance to the shops on W Hastings are. Entry by Cambie Street or Homer Street. Cheap parking downtown Vancouver at 311 W Hastings Street. Picture from Google Maps, street view. Lots of free parking and cheap parking located at Grandville Island. If you like to start your day with a nice adventure, artisan coffee, premier donuts (Lee’s Donuts which happens to be on our list of the 5 best donuts in Vancouver – for good reason), then you can park at Granville Island and take the water taxi across to downtown (about $5 each way). Hence this is best if you are making a lifestyle decision and want to enjoy more of your day. Economically, the time you take to get from Granville Island to downtown Vancouver won’t be worth the cost savings. A great solution for tourists or a day trip too to enjoy Vancouver (when it’s sunny). Realistically, it’s not practical on a daily basis but a perfect solution for those exploring Vancouver for a couple days and looking for cheap parking to roam downtown. Cheap parking at Granville Island for tourist and visitors. Picture from Google maps, street view. We listed Paramount Place parking on our top 10 list of cheapest parking in Vancouver because of it’s central location and lower monthly rate. 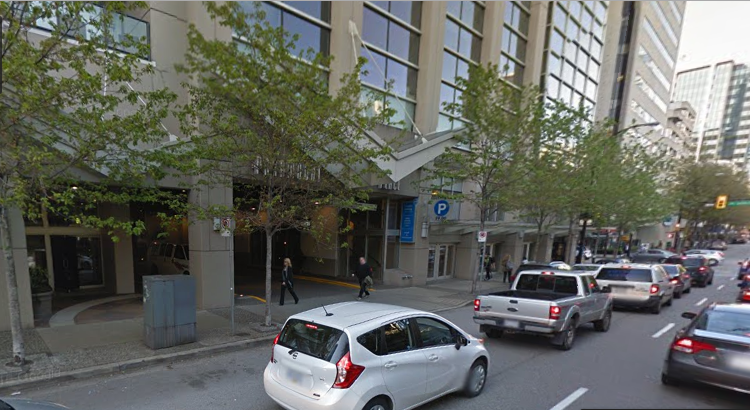 This cheap parking location in downtown Vancouver is situated right where where the Scotiabank Theater is should you wish to catch a movie after the office. At the Hornby entrance, there’s a Tim Hortons and by the Burrard entrance, there’s a Starbucks so you have options for your morning coffee. For your grocery shopping, you can stop by IGA opposite the street or maybe grab a Japadog (which is on our list of top 5 food trucks/carts in Vancouver) at the junction of Burrard and Smithe Street after a day’s work. The parking spot is accessible both on Burrard Street and Hornby Street by UBC Robson. It’s covered parking. Cheap parking in downtown Vancouver at 900 Burrard Street. Picture from Google Maps, street view. Picture of entrance at Hornby Street. Very centrally located and cheap hourly rate for parking in downtown Vancouver. The pricing is excellent for hourly parking in downtown Vancouver although 834 Seymour street may be a better option for cheap hourly parking in downtown Vancouver unless you’r visiting this specific area of Vancouver such as picking up coffee from Timbertrain Coffee Roasters (on our list of the best coffee roasters in Vancouver). As with our earlier mention of cheap downtown Vancouver W Hastings parking, this 330 Cambie Street parking is a good option for day trips cheap parking. It’s rather close downtown and right besides the Meat and Bread shop opposite which is Revolver Cafe. The unassuming entrance leads to a fairly large parking lot behind the building. It’s definitely cheap parking for downtown Vancouver area. This isn’t the best or safest part of downtown but still acceptable. Cheap downtown Vancouver parking at 330 Cambie Street. Hourly rates at $3. Picture from Google Maps, street view. Expensive hourly rate of $6.50 but a fair $130 for monthly parking. The price is good for monthly parking rates. 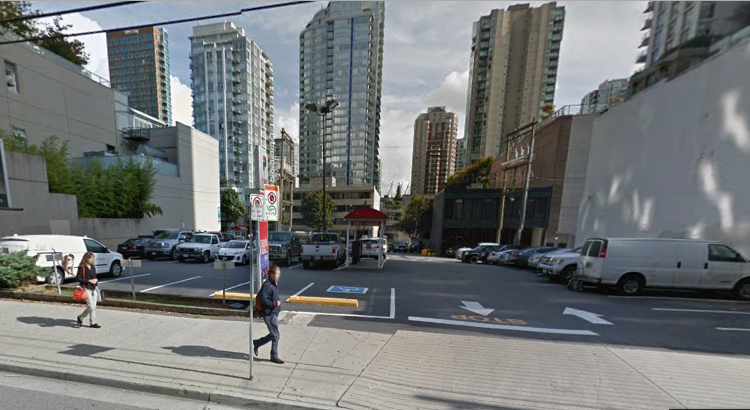 This parking spot in downtown Vancouver is the perfect parking spot location wise for the Waterfront area right outside the Waterfront station with Seabus to North Vancouver, Canada Line to Richmond, and the Sky train across Greater Vancouver Area. It’s a good spot for tourist preferring convenience and security as the parking is gated and indoors. Entrance is at the corner of W Cordova Street and Granville Street. 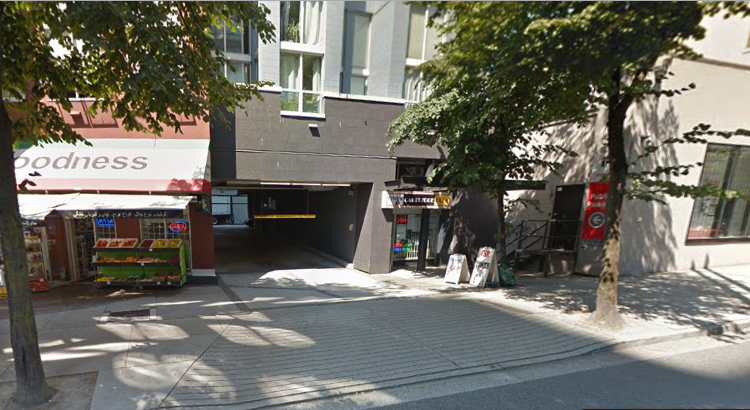 You may enter from W Cordova Street or Granville Street. Cheap monthly downtown Vancouver parking at 320 Granville Street. Picture from Google maps, street view. Hope these help you find your parking options in downtown Vancouver. Bellow are the top 5 cheapest monthly parking in downtown Vancouver as well. 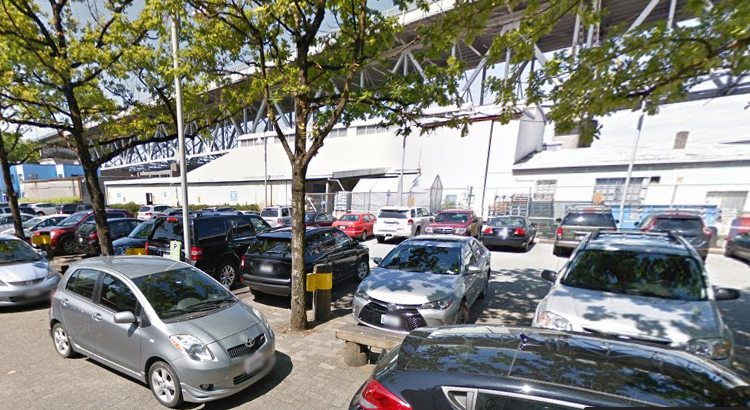 Granville Island – Free parking for visitors. These are best for visitors to Vancouver. There are no economical longer term street parking options (most have limitations to the # of hours) unless you use the meters which then it would be better to get a monthly parking pass from one of the options mentioned earlier. Parking in downtown Vancouver is a peculiar art, central downtown Vancouver parking by Waterfront Station can eat $8 every hour whereas to walk only a block or two later. Even then there are great parking deals to be had that will save you hundreds over time. It isn’t a perfect market and there isn’t perfect information so we hope to help you save more with your parking on VancityAsks.com by revealing the best deals in Vancouver downtown parking and the cheapest Vancouver downtown parking available by hourly or monthly rate. Due to the constant changing rate of parking prices by supply and demand in downtown Vancouver, we will update the list periodically. It’s a quick list which you don’t need to look too long at; just enjoy the savings. The resource mentioned above allows you to plug in the specific hours and days that you’ll be looking for parking in downtown Vancouver and it’ll help you to calculate the estimated costs of parking in downtown Vancouver. Quite a useful tool if you want to browse through a whole lot of options.